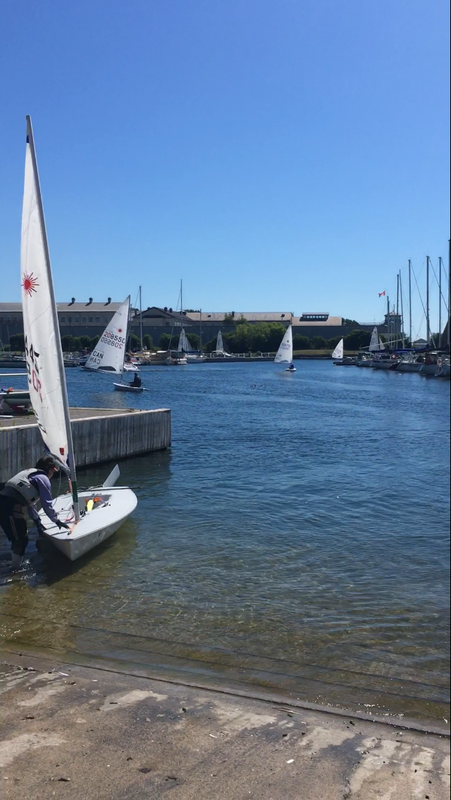 Welcome to Day 2 of the Laser Master Canadians here in Kingston! CORK is thrilled to be hosting 30 Laser Masters! Today was a classic Kingston seabreeze day, building from 7 knots in the morning until 18 knots in the afternoon! The fleet completed 4 races. Going into the final day, the points between leaders are tight, which makes for an exciting day of sailing tomorrow! 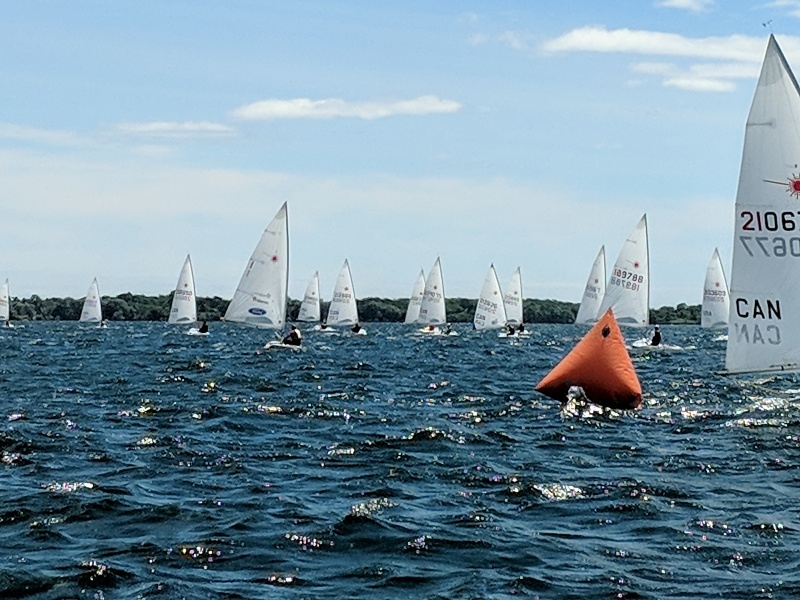 It was “breeze-up at the Viper 640 North American Championship being hosted by the Kingston (ON) Yacht Club and being sailed out of CORK/Sail Kingston. Day 1 saw moderate winds from the south but Friday’s northerly came with a cold front dropping temperatures to the low 70s and increasing wind up to the mid-20s in puffs. Boats with lighter crew weights that enjoyed an advantage on Day 1 found today’s sailing a bit of a challenge. The northerly wind was full of puffs and holes at the bottom of the course with massive oscillations and shifts on the top half. Brad Boston (Port Edward, ON) took over the lead of the 36-boat championship with a two-day 14-point total. Boston entered the day in second two points behind Jay Rhame/Peter Beardsley; but Brad reminded everyone why his name is on the North Americans trophy five times by shifting into high gear today and winning three of Day 2’s four races (with his seventh in Race 6 becoming his throw-out). Rhame/Beardsley fell to fifth with an 11-10-10-9 scoreline. Filling the leaderboard behind Boston is former Viper World Champion Zeke Horowitz finishing with 28 points after a solid 2-4-3-4 day. Zeke again showed his combination of superior boat speed and tactics and pushed Brad to the limits today. Moving up to third place is Viper Int’l Chairman Justin Scott, one point behind Horowitz after a 7-2-6-2 day. Fourth place is now the home of southern California sailor Jay Golison who was the only boat besides Boston to take a win today and recorded 4-1-7-3 in today’s racing. The day was driven by wind shifts and puffs. The bottom half of the course required you to stay right as the puffs were stronger there and the wind was moving right. 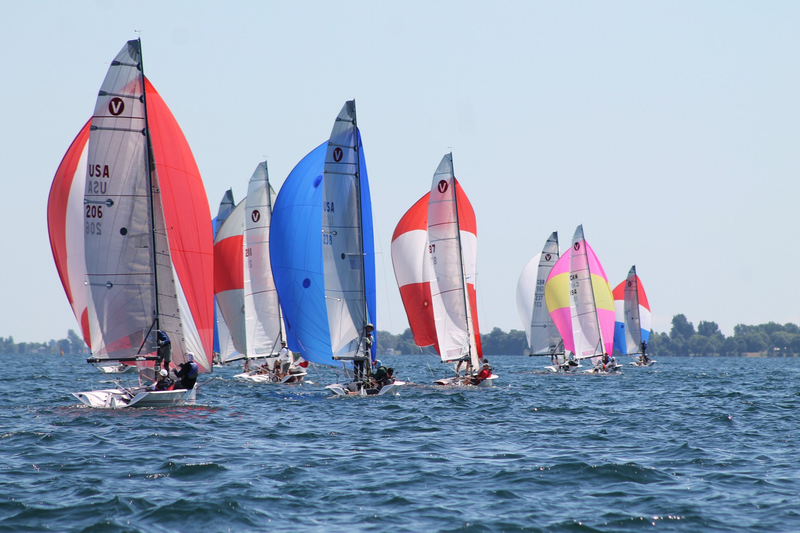 At the top of the course, however, it paid off to stay left as shore effect winds giving boats a port tack lift into the mark. Boat handling downwind was also key. “Keel down is good,” noted Eric White (Annapolis, MD). “The orange keel (White’s boat has an orange keel) never came out of the water today!” Puffs made the runs (as the locals would say) a hoot with some boats hitting speeds of 16-17 knots. Unfortunately, a number of boats found puffs challenging and got their spreaders wet. Day 3 is forecast to have light winds in the morning with ten knots after noon. A warm welcome to our 2018 Laser Master Canadians competitors and volunteers! The day began with the Opening Ceremonies welcoming the competitors, coaches, volunteers and supporters. Kingston’s weather brought in a strong northerly after the evenings cold front. This challenged both the athletes and volunteers with shifty conditions starting with 16-18 knots SSW shifting into 12-16 knots NE. There were 3 races completed today. Racing is scheduled to start at 11:00 am tomorrow. 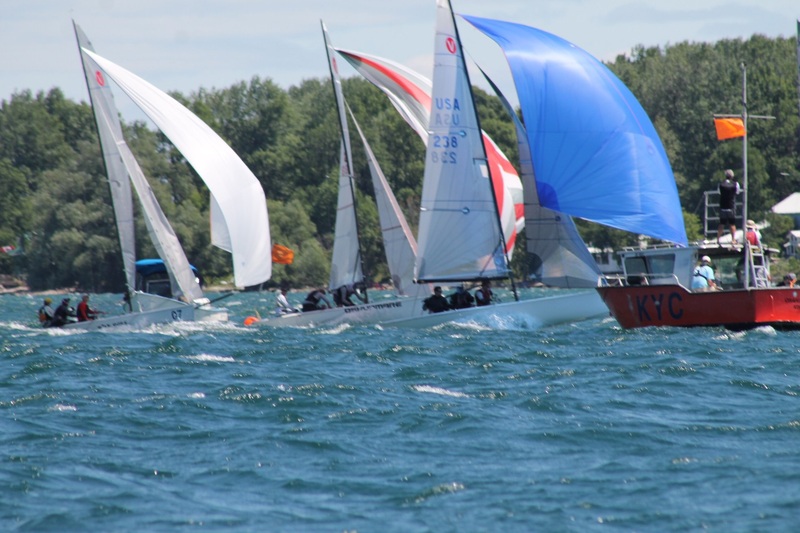 The 2018 Viper 640 North American Championship is being sailed in Kingston, ON hosted by the Kingston Yacht Club and CORK/Sail Kingston. The sailing got underway on time and four races were completed with excellent competition leading the fleet as positions shifted leg to leg; but the lead was held throughout the day by the Rhame/Beardsley team. The Beardsleys (Brooklyn, NY) and Rhame (NY, NY) have been on an upward trajectory within the Class and are the only all-Corinthian team in the top four . Peter Beardsley commented on the day noting, “We were trying to sail cleanly because we have confidence in our boat speed. The hardest part was getting off the line well, which we were able to do, and staying ahead of the solid competition we are facing.” They finished the day with a 1-4-3-1 scoreline for nine points. A slim two points behind in second with finishes of 6-1-1-3 for 11 points is five-time North American Viper Champion Brad Boston (Point Edward, ON) sailing with his boat partner Lee Shuckerow (Detroit, MI) and Nick Lounsbury (Sarnia, ON). In third are Geoff and Mary Ewenson and Erik Broekhof (Annapolis, MD) with 26 points with former World Champion Zeke Horowitz and Ian Coleman (Annapolis, MD) and Jackson Benvenutti (New Orleans, LA) in fourth. Day two promises more of the same winds the sailors enjoyed today. Four days of racing are scheduled concluding on Sunday, July 9. The Viper 640 is a high-performance one-design sport boat. At 21 ft (6.40 m) and only 750 lb. (340 kg) it combines the stiffness of a keelboat with the acceleration and planing abilities of a dinghy. The Viper has a precise and exhilarating feel on the helm, a spacious cockpit for three or more people, strict one-design class rules, and ease of launching by ramp or hoist. With fleets and regattas around the world, there is certainly Viper racing near you. For more information contact Viper 640 Class Association Administrator Ed “Buttons” Padin (epadin@padesta.com) or Rondar Raceboats’ Dan Tucker (Dan@rondarboats.com). 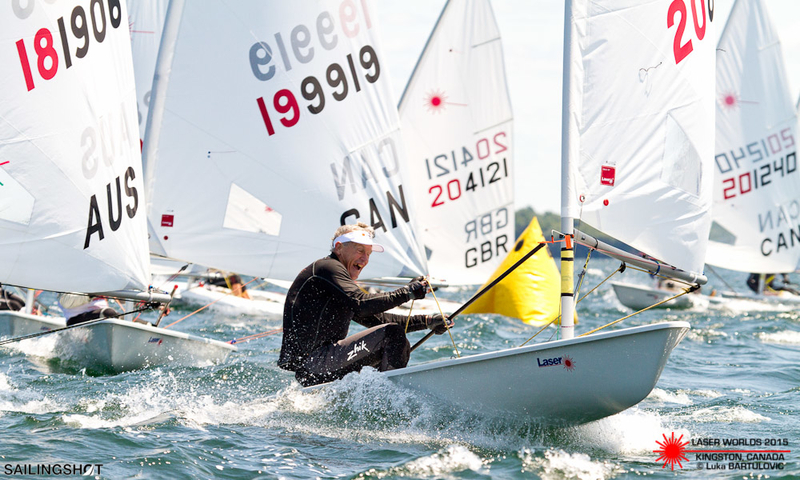 CORK would like to welcome the Laser Master Canadians this year! Join us at the Opening Ceremonies at Portsmouth Olympic Harbour at 9:30AM on July 6, 2018 to kick off an amazing first day of sailing.